A CAP student has taken poignant portraits of people with dementia surrounded by treasured possessions which highlight their individuality. Will Vernon (22), who is studying contemporary art practice, captured a series five portraits of people he met while volunteering at Alzheimer Scotland. He wanted to let the strength of their personalities shine through in his work, taking them out of the context of the resource centre and capturing them in their own environment at home. 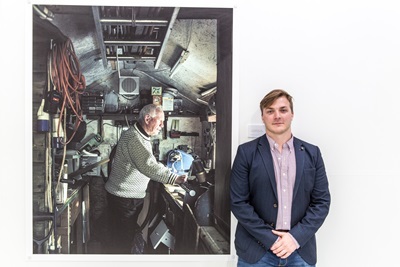 The photographs, entitled ‘The Draughtsman’, ‘The Beauty Queen’, ‘The Stock Manager’, ‘The Welder’ and ‘The Domestic’, have been on show at the annual Gray’s Degree Show this week, with one piece being purchased by Robert Gordon University (RGU) for its arts and heritage collection. Will, who has also been selected as an Invited Graduate to exhibit at the Society of Scottish Artists’ annual show, said: “Through my initial involvement with the NHS as a volunteer in an elderly interim ward and the subsequent role of art volunteer with Alzheimer Scotland, I have gained an insight in to the importance of identity and expression within the condition of dementia. His project has its roots in a previous one, in which he explored memory loss and concussion in rugby players, before developing into its current form through his work with the NHS and Alzheimer Scotland. “The people that I was working with there were really inspiring to me,” Will said. “I got an insight into their unique identities and I wanted to capture that core of who they were and continued to be, even while dealing with dementia. “After talking over my idea with them and their families, I went to their homes to get a stronger sense of who they really are and who they had been. Will, who hopes to apply for the graduate in residence scheme at Gray’s, shot his photos in analogue medium format and used a cable release in order to capture photographs that were as natural as possible. “It meant I could look up and have a conversation with them – it’s a more natural, candid way of working,” he said. “I wanted to capture each of their unique personalities which were apparent to me and apparent to their families, and this method allowed them to be relaxed enough in order to do that.